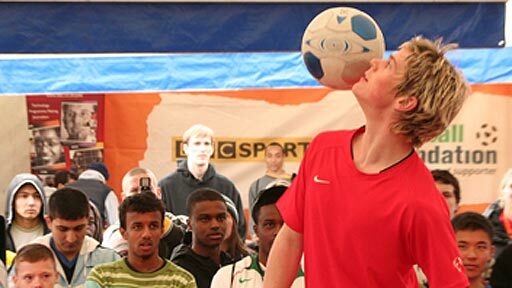 Few would doubt that the biggest draw of the 10 festivals during Your Game 2008 has been the football freestyle performances at lunchtime. While the many workshops on offer have pulled in a wide-ranging crowd, nearly all players have stopped in their tracks to gawp and cheer when the Ball Fusion team have taken to the stage. It is a reaction not lost on the performers themselves. "At other events the most you usually get is a round of applause," says 24-year-old Abbas Farid, the first Nike freestyle champion, who comes from Newport. "But because the audience at Your Game is so expressive, they don't hold back and we get an amazing response. The shouts and cheers are fantastic." The noise and sheer number of people filming the action on their mobile phones during the festivals proves how popular football freestyle has become. Doing football tricks and keepie-uppie is nothing new but TV advertising campaigns, worldwide competitions and the popularity of video-sharing websites like YouTube have led to an explosion in the numbers now trying it. And in turn this has given credence to taking on a career in freestyle with some performers able to command up to £1000 a day for their services. Billy Wingrove, who starred at the London leg of Your Game, has choreographed Nike adverts and as a result has shown the likes of Ronaldinho, Wayne Rooney and Cristiano Ronaldo a new trick or two. He also has a contract with Tottenham Hotspur, performing for them at half-time during matches. But amongst the fancy flicks and juggling, the Londoner believes the creativity involved can help the poor technique recently associated with England's young footballers. "If you look at the world's top players like Cristiano Ronaldo and Ronaldinho, their attributes are co-ordination, ball control, technique and balance," he says. "A lot of the boys and girls at Your Game have those attributes because they've grown up in urban areas where haven't got a lot of space to play in so they've got to use that ability, that skill to beat a player and I think it's so important for the game." "As a young kid I was so small in my class and football was a way of expressing myself," the 25-year-old adds. "I was in year seven at school and I'd be the littlest kid but I was playing with the year 10s because they said to me 'come and show us your skills' and that gave me loads of confidence. "So I played to them, I practised again and again and now it's my full-time job. It's just amazing just how far you can get when you put your mind to something, no matter what it is, within football, freestyle or whatever it might be. If you're that dedicated you can get it." Sceptics might wonder how easy it is to get on the football freestyle ladder with so many competing nations from across the world, particularly those from footballing heartlands such as Brazil, Argentina and Holland. But although Korea's Mr Woo could lay claim to being the most recognised football freestyler through his TV work and shows at Premier League matches, he was eventually trumped by his own protégé from Preston. In 2004 John Farnworth met the man most-famed for his T-Mobile adverts and within two years was taking him on and beating him, making him the world champion. Inspired by the Brazilian Soccer Schools project set up by Simon Clifford, Farnworth, has since set the official world record for the number of Around the World's in a minute. "Of course I believed I could be world champion," he says when asked if he could beat the world's best. "I just thought if I trained harder than anyone else and I was more determined, then I could achieve anything. "I train 40 hours a week, so it is a lot. Sometime six, seven, eight hours a day - it's a lot of repetition on new tricks and keeping on top of other tricks. "People are surprised that the world champion is from Preston and they do ask why are the Brazilians guys not doing it, but I'd say they focus more on doing it in an 11 a-side game. Freestyle tends to be bigger in Europe." The likes of Farid, Wingrove and Farnworth will need to be on their toes if they are to maintain their status at the top of the freestyle network. Inspired by their performances, the age of the new breed is dropping quickly. For example Oli Hayes, from Macclesfield, is 14 and shadowing every move. "I've only been freestyling for about two years but before that I was doing kick-ups in the garden so it kind of came naturally to me," he said. "I went to a competition in Leeds with Ball Fusion and I beat some guy who was 18 and the next week I went to a football exhibition the next week and I was well received. "If I train hard, many hours a day, it shouldn't be too long before I become world champion so keep an eye out for me and I'll do my best." Scarily, as the allure of freestyling grows, it surely won't be long before even Hayes is looking over his shoulder. 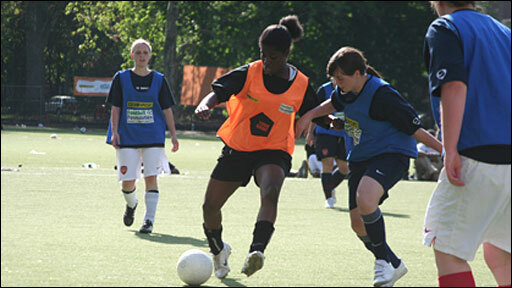 For more information on getting into football freestyle visit Ball Fusion.